In honor of International Stoic Week, I decided to share some wisdom I’ve gained over the past few months and years. Some of this wisdom was acquired through reading the works of great stoics such as Marcus Aurelius and Seneca. However, a lot of what I’d like to share is the knowledge I’ve gained through experience and practice. First I’ll share the knowledge and foresight I’ve accumulated from the greats. Seneca’s collections of essays summarized in the book On the Shortness of Life was the first book on stoicism I read. His insight into how fleeting this life really is was an abrupt awakening. Everyone knows that life is precious and short, but we don’t always live that way. This book is a great reminder that we should try hard to remember that and to live each day with that in mind. Marcus Aurelius has a very similar mindset in his journaling collected in Meditations. A big difference in my opinion is the harshness of his tone. He really slaps you in the face with reality letting you know that you are going to die. Although a bit brazen at times, to many this method of communication is needed. Although not so old, I believe Ryan Holiday will one day go down as a great philosopher of stoicism. He has written several books, three of which their primary focus is on stoicism. The one I’ve read so far was The Obstacle Is the Way, and it quickly became one of my favorite books. The focus of this book is not so much on the shortness of life or that you’re going to die. Instead he focuses on the “how” of living a full life. By surmounting obstacles in our life that try to block our paths we can truly take hold of life and live it to its fullest. This amazing book helps build the mindset needed when confronting seeming immovable obstacles and gives you the tools needed to help move, go around, or even learn to accept them. 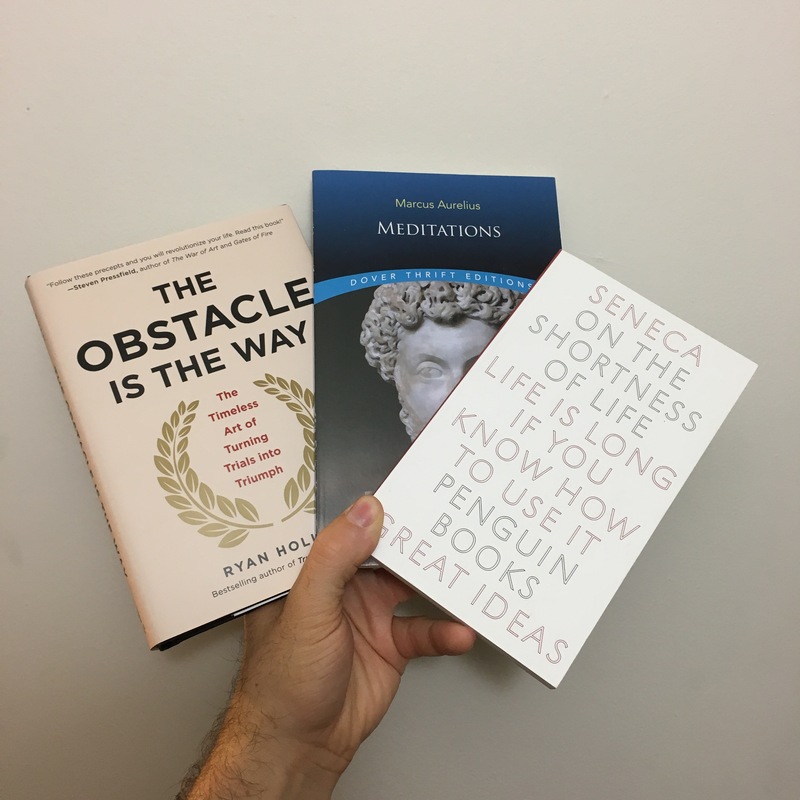 Upon reading these books and seeing through other mediums what living a Stoic life is like, I decided to try it for myself and see how it turns out. So, after reading various philosophies on building a mental toughness, a common theme of coldness appeared. Coincidentally, this lined up with this modern day superman Wim Hof I’d been following for different reasons. His Wim Hof Method, as it’s called, combines breathing exercises, cold therapy, and mindfulness. So I decided to give this cold thing a test.Now for the past 2 months I’ve been taking cold showers all but 3 days and I have to say, it has been life changing. Aside from the physiological benefits described in the Wim Hof Method, there has been considerable mental endurance built. Every morning my will power is tested and strengthened just as one strengthens the muscles in your body.Mark Twain once said, “If it’s your job to eat a frog, its best to do it first thing in the morning.” To some this means do your hardest tasks first thing in the morning to get them over with and the rest or your day will be better. I decided to use this as a mental trick.In Mo Gawdat‘s book Solve for Happy, he discusses the happiness equation as simply being what life throws at you minus what you’ve expected. I’ve used this concept to keep my brain constantly happy. So by taking a cold shower first thing in the morning, I mentally prepare my mind and body for a harsh day. So when life is tough, I’m ready to take it on; and when life is good, I’m pleasantly surprised! Another lesson I’ve begun practicing is living life in the moment, knowing it could be my last moment. “Memento Mori” is a Latin phrase which means remember that you have to die. Marcus Aurelius has a famous quote on this, “You could leave life right now. Let that determine what you do and say and think.” Both of these are symbolized in the coin I carry with me at all times. 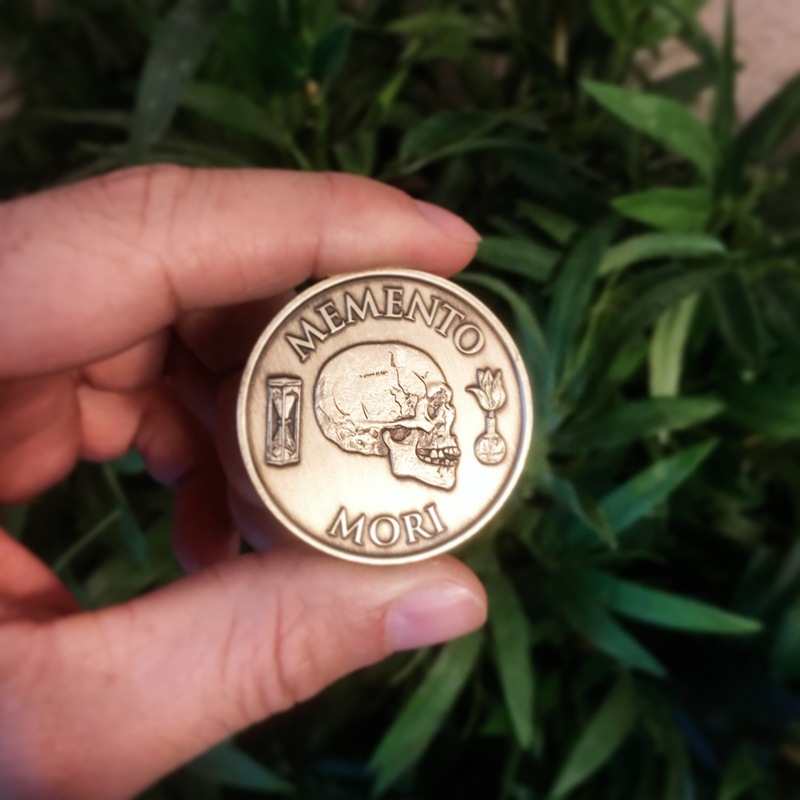 After submitting to a contest in Instagram, I won this coin from Daily Stoic thanks to the ThinkGrowProsper page. I now carry this with me wherever I go. Although I had started living this life a few months prior, this coin is a constant reminder to act accordingly. So often we stay silent when we should speak and speak when we should be silent; stand still when we should take action and take action when we should stand still. When living life knowing that at any moment it could all be over, it feels liberating, allowing you to do, say, and think freely. This has helped build stronger connections with my friend and families as well as meet some amazing people I wouldn’t have otherwise met. Know that life is short, and act accordingly. This doesn’t mean YOLO, it means consider the end in mind with all actions taken. It may seem daunting at first to face life with a hardened exterior and a malleable mind, but don’t let that deter you. Opening your world up to the Stoic life will also open up many doors previously closed. One’s mindset is a powerful tool that if sharpened daily can be used to cut through anything. Let me know if you live a Stoic life, how you do it. If you currently don’t what are your hesitations? And if you’d like help reaching this mindset feel free to shoot me an email or leave a comment below. As always, if this article has helped you at all feel free to share it on social media and let me know in the comments below! It’s reassuring that stoic philosophy is thriving in the turmoil we all face today. © 2016 - 2019 A.D.D.